Bring me to brunch, and I’ll be the girl ordering the eggs benny – Florentine, to be exact. I just can’t say no. The ooey-gooeyness of the poached egg mixed with the richness of the hollandaise, seeping through deliciously sautéed spinach, making its way to a thick cut of sourdough bread or housemade English muffin. I mean, Y-U-M. The spinach in the Florentine tricks you into thinking it’s healthy, sort of, but we all know that’s far from the truth. Because of that, I made it a mission to create a better-for-you version of the beloved eggs benny. But before we get started, I should mention that my better-for-you version isn’t a true eggs benedict, but instead, a healthy breakfast that delivers the same satisfaction without the guilt. Enter the soft-boiled egg. One of the reasons most people order eggs benedict at brunch is because poached eggs can feel like a mystery to make, so it’s a delightful treat when you’re eating out. But it doesn’t have to be that complicated. Soft-boiled eggs are a much easier way to get the feel of a poached egg but without the hard work. All it takes is a pot of boiling water, an egg, and six minutes of your morning. A rinse under cold water and a gentle peel, and you’re on your way. Soft-boiled eggs go great over a salad, avocado toast, or this better-for-you benny. Heat olive oil and butter in a pan. Add mushrooms and sauté until tender, then mix in spinach cook until soft. Set aside. If making the tomatoes, add a tablespoon of olive to a pan. Add the cut grape tomatoes and a healthy amount of salt and pepper and sauté for about 8 minutes. Meanwhile, bring a pot of water to a boil. Add eggs and set a timer for six minutes. Once done, remove and run under cool water. Gently peel the egg (I repeat, gently – we’re dealing with liquid yolk-gold here, people). 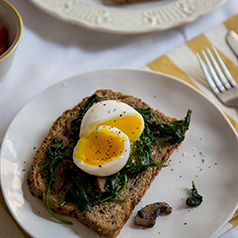 Lightly toast the bread and top with the spinach-mushroom mixture and the soft-boiled egg. Plate the tomatoes or add them to the toast. Give a couple of grinds of pepper and sprinkle with coarse salt. With a sharp knife, cut down the center of the egg and stand in awe of your perfectly boiled egg. Now, go on – dive in and enjoy. Tip: If you’re a fan of avocado, try a soft-boiled egg over avocado toast. Toast the bread, top with half of a smashed avocado, a drizzle of olive oil, soft-boiled egg, crushed red pepper, a grind of garlic, a grind of pepper, and a sprinkle of coarse salt.